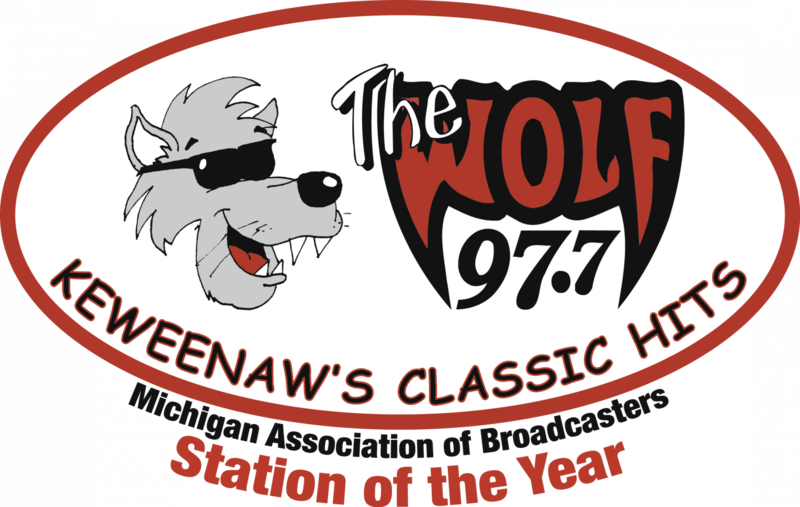 97.7 The Wolf loves to run contests, and give prizes to our listeners. To help give all our listeners an equal chance to win, we have established contest rules. The following rules apply to our general, day-to-day contests, including (but not limited to) the Stack-O-Stuff Giveaway each weekday morning, occasional telephone call-in contests, and contests administered by our satellite programming provider, Dial Global. In general, these contests offer varied prizes valued at less than $100.00. For larger contests, separate rules are created. Rules for those events are posted on pages specific to those events. If you have any questions about which rules apply to a specific contest, please call our office during business hours at (906) 482-7700, and we’ll be happy to clarify. Dates of Contest: As specified per contest or promotional message. How to Enter: As specified in contest or promotional message. How to Play: As specified in contest or promotional message. Prize(s). The prize(s) that may be awarded to the eligible winner(s) are: Specific to contest. If a winner is disqualified, the Company reserves the right to determine an alternate winner or not to award that winner’s prize, in its sole discretion. Prizes of equal value might be substituted. Claiming Prizes. Prizes must be picked up by the winner in person at the Houghton Community Broadcasting office at 313 E. Montezuma Avenue, Houghton, MI 49930, within 14 days after prize is awarded. The winner must provide valid government-issued photo identification, provide their complete address, date of birth and phone number, and sign a prize release form to claim a prize. If a winner wishes some else to pick up the prize on their behalf, they must notify the Company in advance. Entrants who are determined to have falsified entry forms in any way will be disqualified. Eligibility and Limitations. A parent or guardian of any participant who is a minor must sign a release on behalf of the minor to be eligible to receive a prize, but the Company reserves the right to refuse to award a prize to or on behalf of any minor. Only one (1) prize per household for contests with multiple prizes. Only one (1) prize valued at less than $100 per household from any of the Company’s stations within any thirty (30) day period, and no more than four per year. Only one prize valued at more than $100 per household in any 13-month period. Employees of the Company, this contest’s participating sponsors and their advertising agencies, employees of other radio or television stations, former employees who worked for Houghton Community Broadcasting or any of its predecessor companies within the past two years, and members of the immediate family of any such persons are not eligible to participate and win. The term “immediate family” includes spouses, siblings, parents, children, grandparents, and grandchildren, whether as “in-laws,” or by current or past marriage(s), remarriage(s), adoption, co-habitation or other family extension, and any other persons residing at the same household whether or not related. Telephone and Delivery Disclaimer. Participants are restricted to the use of ordinary telephone equipment. Participants that enable the “Caller ID” block function will not be allowed to participate unless they enter their correct area code and telephone number. The Company disclaims all liability for the inability of a participant to complete or continue a telephone call due to equipment malfunction, busy lines, inadvertent disconnections, acts beyond the Company’s control, or otherwise. The Company disclaims all liability for any delays, mis delivery, loss, or failure in the delivery of any item sent by mail, courier, express, electronic transmission, or other delivery method. Entries must be handwritten. No photocopies or mechanical reproductions of entry forms is permitted. internet, service outage or delays, computer difficulties and other technological problems. Publicity. By participating, all participants and winner(s) grant the Company and contest promotional sponsors exclusive permission to use their names, characters, photographs, voices, and likenesses in connection with promotion of this and other contests and waive any claims to royalty, right, or remuneration for such use. Miscellaneous. Each winner must submit proof of eligibility and sign the Company’s release form to claim the prize. No purchase necessary to participate or win. Void where prohibited. Odds of winning depend upon the number of participants. The Company may substitute prizes of equivalent value, amend the rules or discontinue the contest at any time as announced on the station. The Company disclaims any responsibility to notify participants of any aspect related to the conduct of this contest. Written copies of these rules are available during normal business hours at the business offices of the station and by mail upon written request with a stamped, self-addressed return envelope.